Aligning a TS-430S, or "wait, how am I supposed to check FM again?" 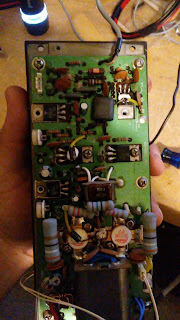 I'm fixing another (I know I know) TS-430S for a friend. Yes, this means I'm returning it back to them. After all of the repairs I had to do to get the thing up and going reliably I did an RX carrier calibration. It was a little bit off - a combination of using WWV at 10MHz and the scope to calibrate CW, USB and SSB. However, the AM and FM carriers didn't at all meet the expectations of the service manual. Notably, the AM carrier is seemingly the same as the USB carrier on transmit and there isn't one on receive. The FM carrier just didn't appear during receive or transmit. But .. it's transmitting FM. Now, I need to go get the TS-430Ses I've fixed and compare the carrier behaviour to the other rigs, but .. well, they work on AM/FM receive and transmit. So ok, let's figure it out. The AM carrier matches the USB carrier. It's weird because the circuit has an AM/FM carrier crystal however.. yeah, AM carrier here is linked to the USB carrier. I need to figure that out. And the FM transmit has no power control - it's 100W carrier only. So the only way to do it without dumping 100W out into the finals whilst adjusting it is to remove the RF drive output on the RF board (which feeds the finals with RF), attach a 50 ohm resistor across it and check the final RF carrier signal on the scope. This worked mostly OK but since there's no ALC feedback, the output is .. very distorted. Now, I don't know if these rigs were supposed to output a clean sine wave at all carrier output settings but .. well, they're very loud signals on lower bands, sometimes more than 8V peak-to-peak, which is almost triple what you need to feed the finals to get 100W out. So I got it in the ballpark - because well, the thing is not outputting a true sine wave here because the carrier output is way too high - and then had to resort to checking using a directional coupler and the scope. Now, this isn't too bad - I was in the rough right spot for the FM carrier frequency anyway, and I can key down for a few seconds at a time without making things sad. But, this step was delayed until I verified the finals were working and that took a lot of work to get right. It turns out it was on the nose anyway after all of that and FM modulation now works great. So - if you're aligning a TS-430S, the AM/FM carrier bit in the service manual may not be entirely correct. 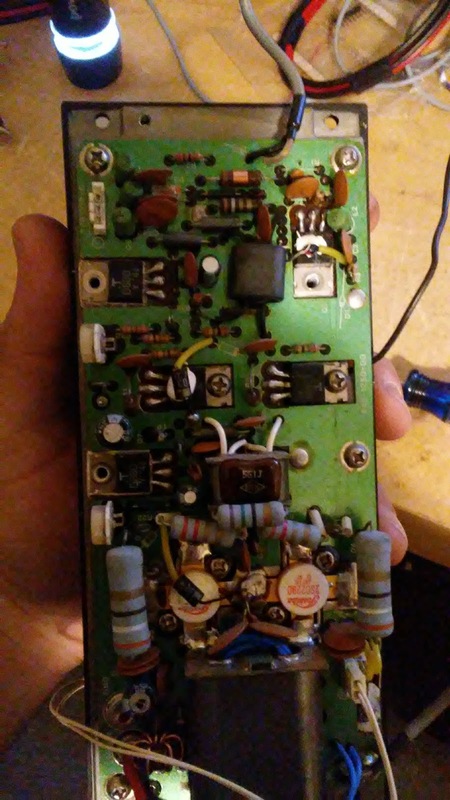 Restoring a TS-430S, or "dry joints and stray RF: a tutorial"
I recently acquired a TS-430S HF transceiver. The seller claimed the FM board and full complement of filters worked, but no display, buttons/LEDs or sound. He said it worked until he sent it in to have filters added. I figured it was going to be something simple. Boy was I both right and wrong. These rigs have a habit of dry joints everywhere. So, I powered it up to see - yes, no display. Ok - step 1 - check power rails. I discovered there was no 5v line. The IF board has the 7805 regulator, so it is time to check for dry joints. Oh look! Some very dry joints. I bet these were marginal until the tech installing the filters jostled it about. I fixed these any anything else I could find on the IF board. I then powered it up. One digit showed up - the optional 10Hz digit - but all the lights and buttons worked. Now, this rig has a separate PLL board for the main VFO which exports a signal that blanks the VFO output and the display. Amusingly it doesn't blank the final digit though. Ok, so it's likely PLL unlock. The PLL board was getting power, but ... no stable 36MHz base oscillator. That's on the control board. I pulled that out to find more dry joints around that circuit and its connector - so, fixed that. I fired it up again. The PLL board was still unlocked even though the 36MHz oscillator was now working. I spun the dial and measured the other VFO feeding the PLL board - this is the fine grain frequency selection that gets mixed in to the PLL boards four VFOs to output the final VFO signal. 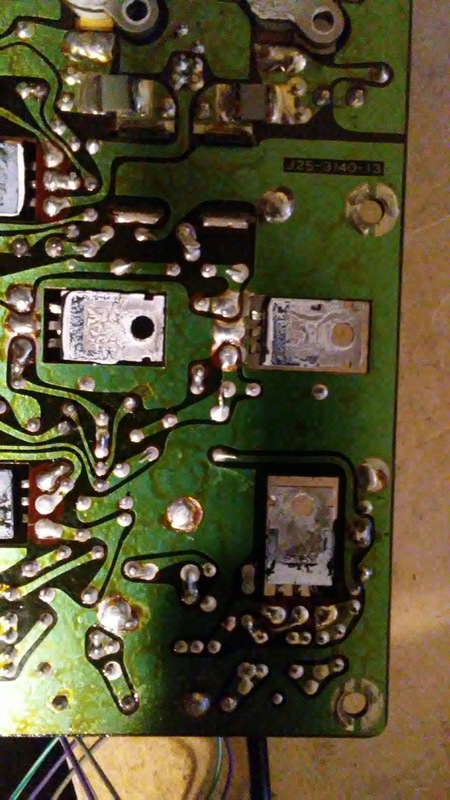 It was moving OK - so the control board and the other PLLs were OK. Next - check the four VCO selection lines - nothing. The PLL board has four varicap diode based VCOs and a PLL loop. The control board outputs the band select data to the RF board which decodes it and drives the PLL VCO, the relay based LPFs and the receiver HPFs. There were multiple issues - the control board bandpass lines were wrong and the VCO select lines were wrong. Next - the RF board. Dry joints everywhere. Here is one of many that linked ground planes together. 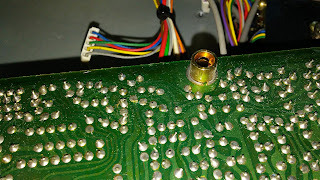 And this one was on the VCO output connector. 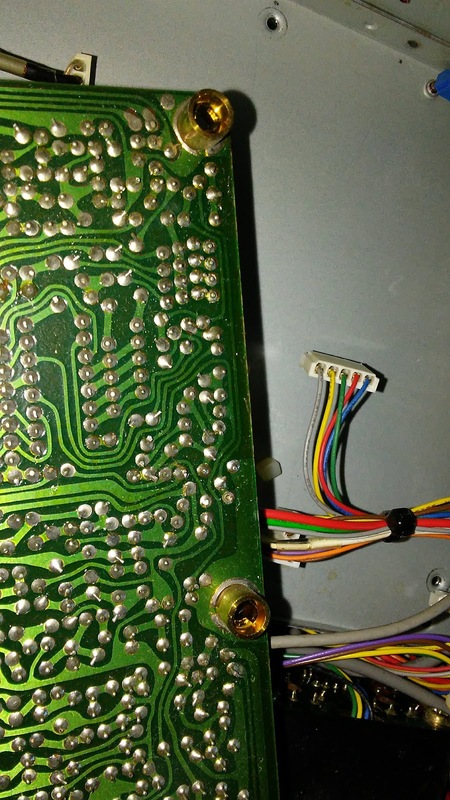 I removed the TTL IC that did the BCD to output line demuxing because it was dead and fixed the dry joints. But the control board was still outputting the wrong band info. It turns out the IO expander IC that drives those four lines had two dead IO lines. So, that needed replacing too. At this stage the control board was OK, the band select lines and VCO select lines are OK, but no PLL lock. Time to diagnose the PLL board. 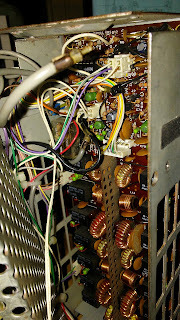 First up - the varicap VCO was working. Wrong frequency but working. The circuit takes the output of that, buffers it though a transistor amplifier, shapes it into a square wave and divides it down via a pair of TTL chips and feeds it into the PLL control IC. Next - the 5v line on the PLL board was ... suspiciously low. 5v was coming in OK, but something was dragging it down to 3.8v in places. That is too low for TTL. I checked each chip and... the 75S112N flip flop chip was running hot. Ok, so that needed replacing. Note it is S and not 74LS - the PLL loop runs from 45 to 75MHz, so it needs speed. With that chip replaced the 5v rail was again at 5v. But, no PLL lock. So I then traced the PLL loop. VCO was OK. VCO though the buffer amp wasn't. 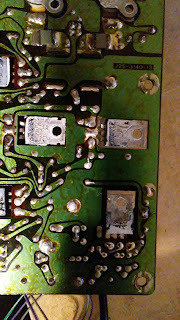 I pulled out the transistor there and it was open circuit. I didn't have an equivalent so I found a close enough one for now and ordered a replacement. But then it was sill not working right - the signal level into the TTL NAND chip was super low. 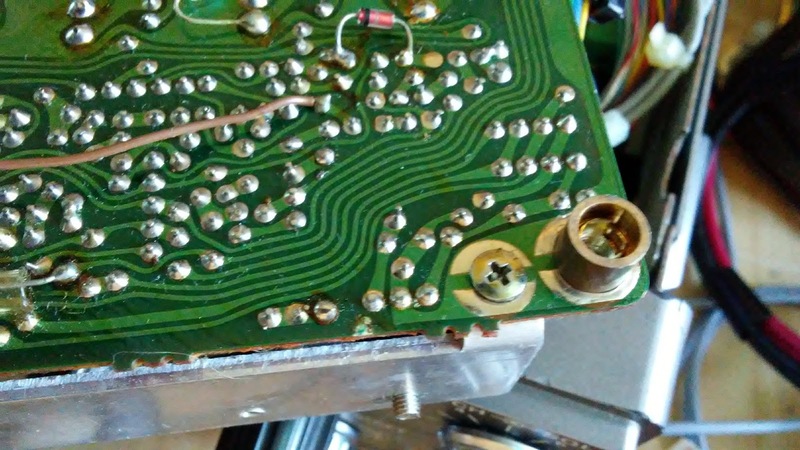 I figured either the transistor I replaced it with wasn't biased right or the TTL chip was pulling its input low. Indeed it was the latter - the input side was shorted to ground. I replaced that chip and the rig sprung to life! I recalibrated the four VCOs now that I had replaced some parts. It was locking OK on all bands. But - the receive signal was low. I checked the attenuator switch - no go. 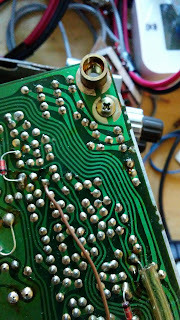 I disconnected the attenuator control cable to the RF board - RX sprung to life! A little solder reflow on the switch board and that fixed that. After that I just did the obligatory filter and finals board check and reflow. One LPF relay clean procedure and finals alignment later and it's all ready to go. The SWR foldback protection needs fixing and I need a 150 ohm dry load to do that, so that's my next week project. As to how those parts all failed, likely at once? My guess is stray RF fried a path somehow. I'm glad this was the extent of the part damage! FreeBSD and APRS, or "hm what happens when none of this is well documented.."
Here's another point along my quest for amateur radio on FreeBSD - bring up basic APRS support. Yes, someone else has done the work, but in the normal open source way it was .. inconsistently documented. The Baofeng is easy - set it to the right frequency (VHF APRS sits on 144.390MHz), turn on VOX so I don't have to make up a PTT cable, done/done. 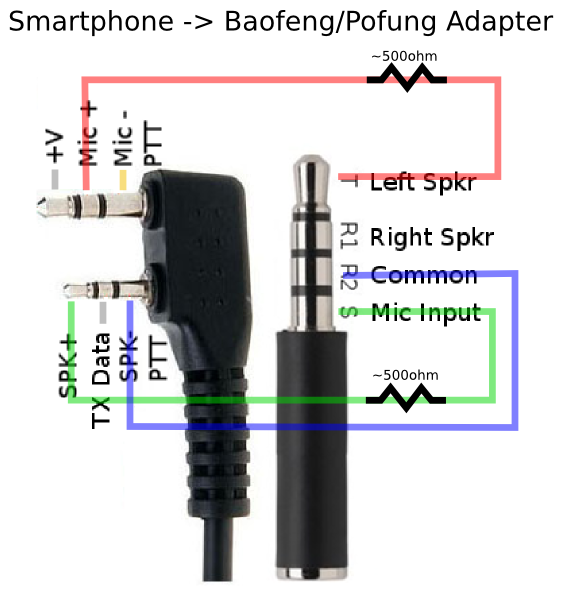 The PTT bit isn't that hard - one of the microphone jack pins is actually PTT (if you ground it, it engages PTT) so when you make the cable just ensure you expose a ground pin and PTT pin so you can upgrade it later. 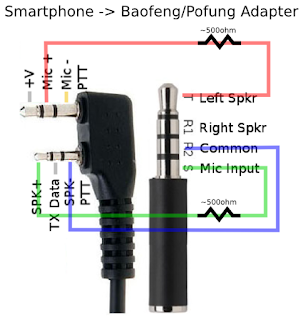 The cable itself isn't that hard either - I had a baofeng handmic lying around (they're like $5) so I pulled it apart for the cable. I'll try to remember to take pictures of that. From the baofeng I just wired it up to the transformer, then the output side of that went into a 0.01uF greencap capacitor in series to the microphone input of the sound card. In both instances those capacitors are there as DC blockers. Ok, so that bit is easy. Then on to the software side. The normal way people do this stuff is "direwolf" on Linux. So, "pkg install direwolf" installed it. That was easy. Editing it isn't that hard - you need to change your callsign and the audio device. OK, here is the main undocumented bit for FreeBSD - the sound device can just be /dev/dsp . It isn't an ALSA name! Don't waste time trying to use ALSA names. Instead, just find the device you want and reference it. For me the USB sound card shows up as /dev/dsp3 (which is very non specific as USB sound devices come and go, but that's a later problem!) but it's enough to bring it up. So yes, following the above guide, using the right sound device name resulted in a working APRS modem. Next up - something to talk to it. This is called 'xastir'. It's .. well, when you run it, you'll find exactly how old an X application it is. It's very nostalgically old. But, it is enough to get APRS positioning up and test both the TCP/IP side of APRS and the actual radio radio side. So, that was it! So far so good. It actually works well enough to decode and watch APRS traffic around me. I managed to get out position information to the APRS network over both TCP/IP and relayed via VHF radio. I've been teaching myself HF electronics and antennas lately. I thought I'd go write down some of the things I came across whilst tinkering with this hardware. First up - I decided to choose the Kenwood TS-440S. It's a mid 1980's solid state rig with only a few components hidden away in custom ICs. There are some parts that you just can't buy new anymore (mostly these custom parts and stuff in the final RF amplifier section) but by and large it's all a big set of interconnected single-sided PCBs covered in cables and discrete components. There's the occasional bit of 74LS logic too. It has some pretty clean and sensitive RX paths and TX is supposed to be very good for hours and hours of work. However, these devices are pretty old, and 30+ year electronics can have a large amount of wear and tear. There are some pretty well known crappy issues too. One of them is the SonyBond compound used in the VCO (voltage controlled oscillator) sections - it's hydroscopic and degrades over time. 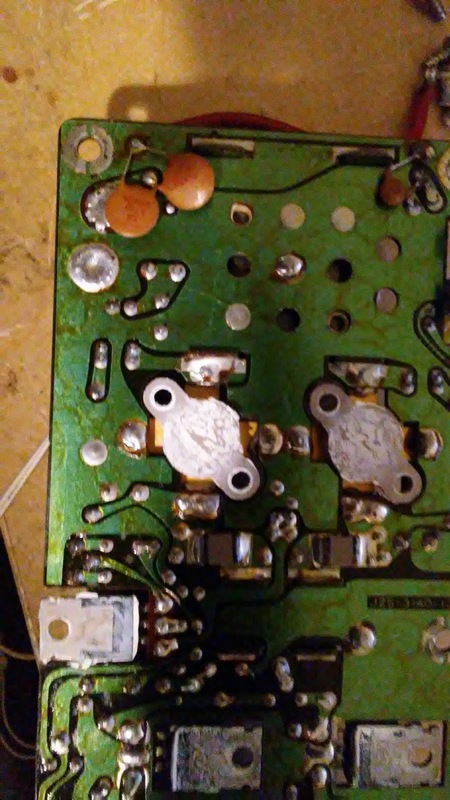 This ends up throwing the VCOs way off and you end up having to clean it off of the PLL/RF boards. This is pretty well documented and although time consuming, it's not impossible to fix yourself. I'll try to do a follow-up post with some pointers on tuning the TX path behaviour because I found a lot of really inconsistent suggestions on tuning things. The service manual is also a bit confusing at times on what voltages you should see where. There are also issues with broken connectors and a lot of dry joints. I found a lot of dry joints in my 440s, which required a lot of tidying up. Next up in the TODO list for me is tuning the RX sensitivity to make sure it's optimal. So, what I found with the first rig I fixed up! I wish I had taken more photos; I'll do that soon just for demonstration purposes. There were lots and lots of dry joints. Everywhere. Sonybond needed cleaning up - and when you do that, you have to tune VCO1 - which is the VCO generating the primary RF frequency for first stage mixing. This is used for both transmit and receive. The IF board was putting out a nice, clean 8.83MHz carrier, so that was nice. The transmit path hadn't been aligned in a long while, so the waveform on the output of the RF board was splatting overly large signals (> 3v peak to peak) into the finals, and this caused the finals to get very upset. .. and then ALC wasn't adjusted, so the filter board was overly aggressively asserting ALC. The transmit power control was very touchy - 100% carrier level at like 5% turning of the carrier level knob. Once the transmit path on the RF board was properly aligned, the RF drive output was properly putting out around 2.5v ptp -> 3.0v ptp and ALC was re-aligned on the filter board, the finals were behaving much better and the TX power control was much more linearly controllable. I'll go into some more detail later with pictures!